Pavement preservation is the proactive maintenance of roads to prevent them from getting to a condition where major rehabilitation or reconstruction is necessary. Preventative maintenance costs are far less than the ultimate repair cost. The diagram below is a typical life-cycle curve for a pavement. 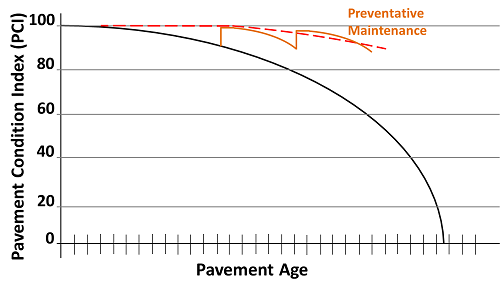 The curve is fairly flat in the initial years of the life-cycle curve, then as it ages, the pavement condition declines to a poor condition after it has aged approximately 75% of its life (typically 20 years). As shown on the curve as the pavement condition worsens the treatment changes resulting in higher treatment costs. As shown below the cost comparison between preventative maintenance and reconstruction is more than 10 times. As shown on the figure below by proactively maintaining the roads the pavement life is extended maximizing the value of each dollar spent on the roads. Another important benefit of utilizing the pavement preservation approach is that because the treatment costs to preserve the good roads is substantially less it enables our Department to preserve 4 to 10 times more streets than if we focused on fixing the bad roads first.